CIVIL LITIGATION, 6th edition enables aspiring paralegals to quickly grasp the principles of litigation practice through practical, hands-on instruction. The Sixth Edition has been updated to include all recent advances in legal practice, including the use of electronically stored information (ESI) and e-forensics in the discovery process. Updates to federal rules and procedures keep the Sixth Edition current and give the reader the most up-to-date information available. 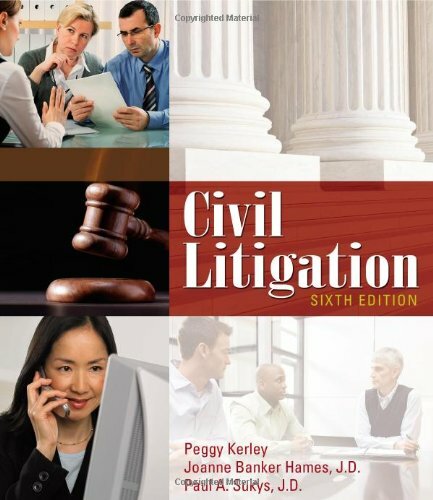 In addition, each chapter in CIVIL LITIGATION, 6th edition includes an exercise that focuses on a single case, giving the reader the opportunity to work it from beginning to end, simulating an on-the-job experience. Plus, the Sixth Edition contains a number of sample legal documents, such as complaints, interrogatories and deposition summaries, as well as legal vocabulary indexes. Each chapter focuses briefly on the impact of technology on the litigation field, and also contains useful references to litigation-focused websites.